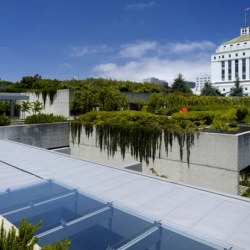 The Oakland Museum of California was introduced as a radical, modern, and green concept. A major renovation is underway to enhance the extraordinary vision of this 40 year old urban park and cultural complex. 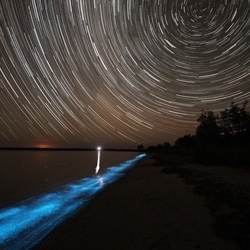 Phil Hart's photos of Bioluminescence in Australia's Gippsland Lakes will make you want to bath in their phosphorescent glow. 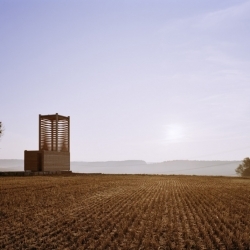 Two wonderful wood chapels: in Poland by beton and in Germany by students of the IIT. 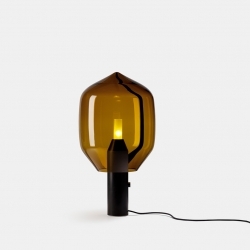 Lighthouse by Ronan & Erwan Bouroullec for Established & Sons. 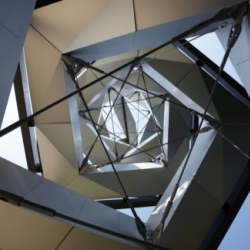 A contemporary lamp using the traditional know-how of Venini, Italy. 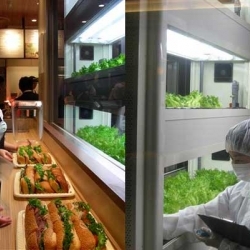 A Japanese Subway sandwich shop has started growing hydroponic lettuce right in the middle of the store! Not only is this hyper-local lettuce healthy, it’s a great visual centerpiece for the space. 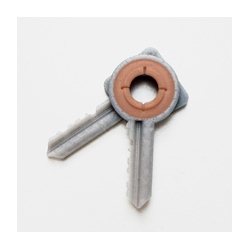 A key and key holder in just one piece. 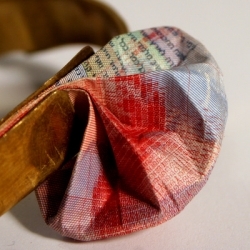 A design by London based designer Oscar Diaz to see at 'New Simplicity' . An exhibition about simple design now. 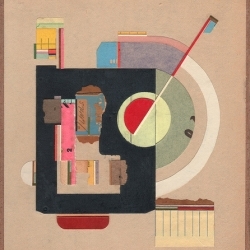 The exhibition opens in London next week-end. Assos is a Swiss manufacturer of cycling clothes. Ruby³ architects designed a shiny new showroom in black and white adapting the corporate identity of Assos. 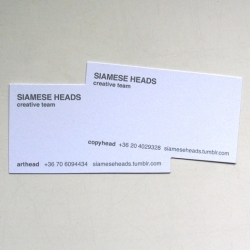 A siamese business card. Which raises a question: why do they need 2 phone numbers? Speesees! (Say it aloud and it makes more sense) The "friend" is "stuffed with lavender + lentils and has a buttery-soft organic sherpa covering. 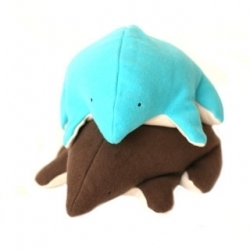 So cute and cuddly. 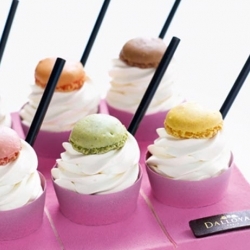 These are the new pastries Dalloyau (famous Parisian cake shop). This summer, the brand has innovated : these cakes are drinkable. This jewelery tries to ask a question about value, what the aesthetic value of objects is that has defined currency value? How soon is the day that people will decorate themselves with actual money? 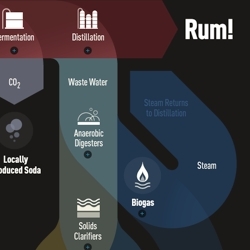 DonQ's rum making process is amazingly green. 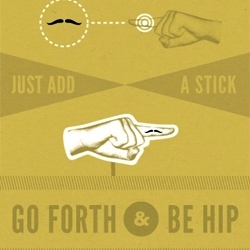 This interactive infographic shows how it works. 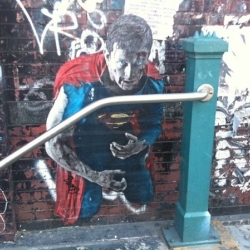 We’re not sure who the artist is behind this amazing Superman wheatpaste outside of the Lorimer stop in Williamsburg, but we’d definitely agree that the oft-delayed L train could use some superhuman help most mornings. 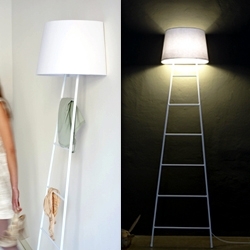 'Sleepy Lamp' by Studio Klass, somewhere between furniture and mood light. 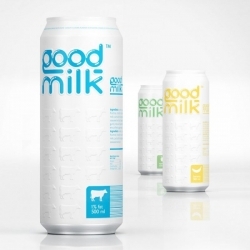 Cool packaging and design for "Good Milk". Now available in aluminum cans and Tetra Pak. 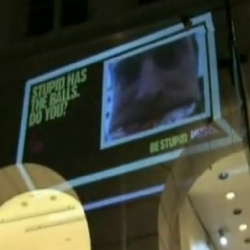 To engage its consumers, Diesel has created an interactive campaign inviting people to share their more stupid photos. Then photos were projected in the street. 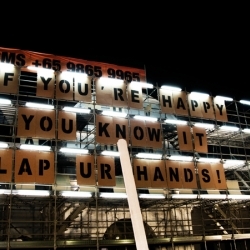 The world's slowest (and biggest) SMS billboard. 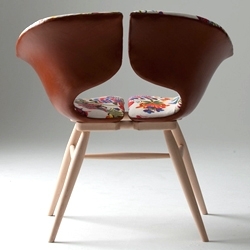 Tortie Hoare's cool ideas for leather furniture. 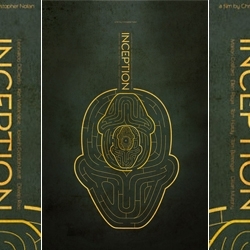 Designer Ibraheem Youssef seems to have traveled forward in time, seeing how the film "Inception" has become a hit film forever, putting his unofficial poster for it right in there in his collection of cult classics. 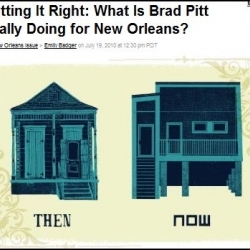 "It’s a surreal scene: a hyper-modern housing development in the middle of nowhere that answers some of New Orleans’s oldest building challenges even as it clashes with the city’s traditional patina." - GOOD on the MIR project. 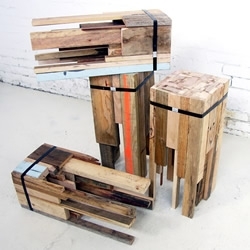 These Offcut Bar Stools are part of a Melbourne based exhibition that features 10 architects, each using 10 different types of recycled materials are these wonderfully rustic bar stools, courtesy of Edwards Moore Architects. 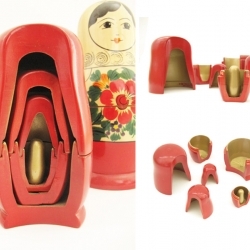 Matryoshka, taking a different look at the inside of the traditional Russian nesting doll from Inon Rettig. Greek architect Nikos Koukourakis has completed a house in Dionysos, a residential suburb in northeastern Attica, Greece — about 23 km northeast of Athens. 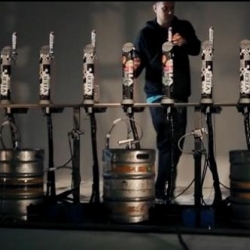 When music and art meet bottles of beer, you get a fabulous video full of beautiful sounds and lights. 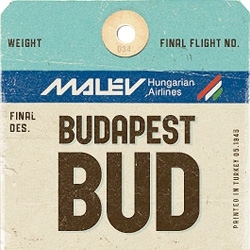 Mix by DJ Cheeba. Perfect. 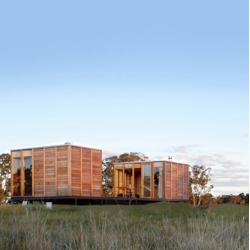 Arkit, an Australian Architectural group, are to construct a full scale ecostudio prefabricated house as part of Melbourne’s annual state of design festival. Fedrigoni created posters for the London Showroom in order to connect designers and paper art. 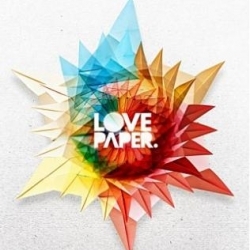 Very creative and a real pleasure for paperart fans. Check out this amazing concept for Mars. 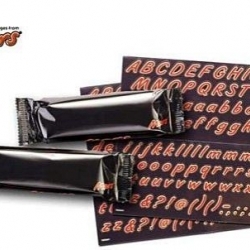 The agency FHV BBDO won a Gold Lion at Canne's Advertising Festival with this packaging people can share with personal messages. 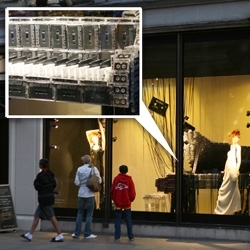 FEATUREDHarvey Nichol's current window display is an incredible series of things... made of things! Like piano made of cassettes, dress made of clothes pins, bike out of tools... and an awesome car of toys! 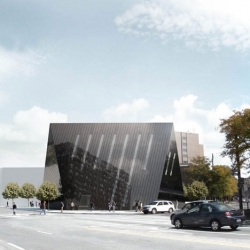 London-based Foreign Office Architects are redesigning a new museum building for The Museum of Contemporary Art Cleveland. 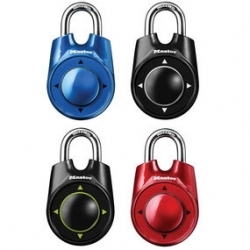 The 1500i Speed Dial combination lock from Masterlock opens on directional movements. 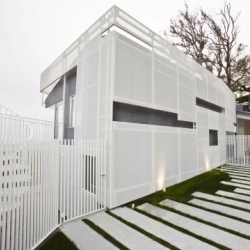 aluminium"Jovanovic Residence" in Brentwood - California by Lorcan O’Herlihy Architects. A house extension cladded with a metallic wrap. 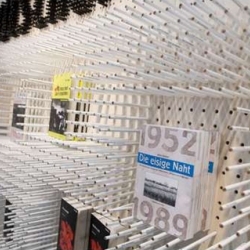 Bookshelf that is made from 15,000 pencils by Johannes Albert for Mittledeutscher Velrag publishing company. 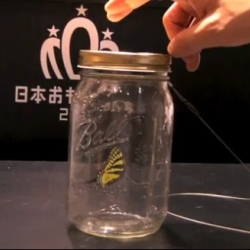 This toy at the recent Japanese gift show looks and behaves like a real butterfly in a jar. The Chouchou Electric Butterfly from Tenyo. 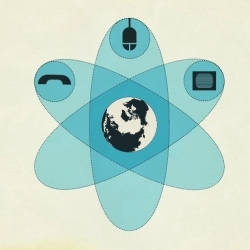 Astra, covering everything you need to know about the operation of a satellite. 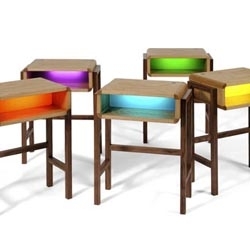 The Night Light Table, a glowing nightstand developed by designers Charlie Crowther-Smith and Richard Bannister. There are 6 billions peoples in the world. It is not ready for everyone yet but today, "Public Gothic Font Family" is available in 42 new languages! Awesome and casually complex paper collages by Jacob Whibley. 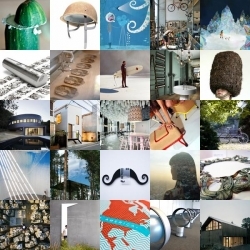 FEATUREDThis week’s NOTCOT.org roundup gives a real sense of adventure, capturing inspiration from a range of media, from architecture to illustration. 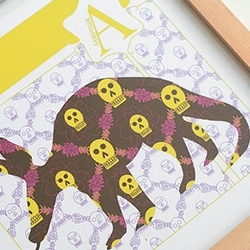 A is for Aardvark and an Animal Alphabet inspired by illuminated manuscripts and pattern filled quilts. 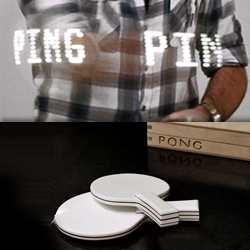 FEATUREDThe motion activated LED 'Ping Pong' bats by Troika are one of 5 sets of table tennis art /game designs inspired by Ron Arad's classics and his fascination for the game. 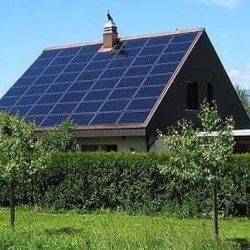 Design houses that use solar cell technology applications designed to prevent global warming. 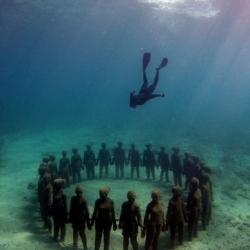 Jason de Caires Taylorcreated the first underwater sculpture park in Grenada, West Indies. 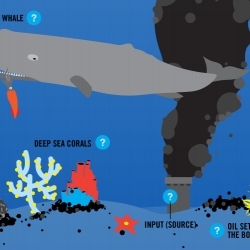 He created an artificial reef for marine life to populate, including planktons and corals. Bloody silver jewelry, design by Mexican designer Carmen Zambrano for LUSASUL brand. 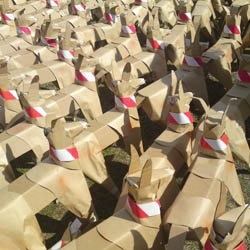 London artist Akane Takayama has turned school children into installation artists through her DOG Sculpture project. Over 700 dogs gather at parks throughout the city this summer.